The Beatles 50 Years Ago Today: January 18, 1968. Beatles Radio: The Beatles, Solos, Covers, Birthdays, News The Fab 4 and More! 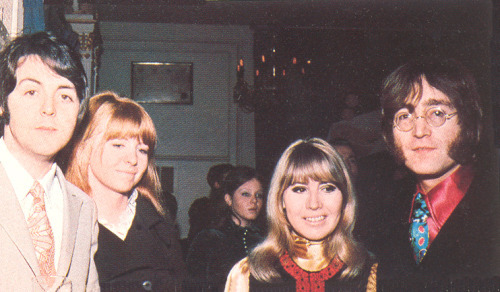 January 18, 1968 - Paul McCartney & Jane Asher with Cynthia & John Lennon at the press reception launching Apple Corps newest act, The Grapefruit, and celebrating the release of their first record, Dear Delilah (January 19th). Ringo & Maureen also attended, but George was away in India.